A talented photographer who lands a lucrative job in Paris with a scandal-mongering tabloid and becomes romantically involved with an eccentric children's book publisher while resisting the sexual advances of another photographer. A bank robber tries to return his girl, but a crazy way of life coupled with an insane company make the case only worse. A team of astronauts land on an inhabitable planet and form a society. Many years later, a single astronaut is sent to the planet and becomes a messiah. the film covers the last few days of fragile Chopin's professional life. A story of the doomed passion by two mortally ill people: he is physically, she is morally. Witold just failed his law-school examinations and Fuchs has just quit his job at a Parisian fashion company. Arriving for a few days away at a so-called family guest-house, they are greeted by a series of unsettling omens: a sparrow hanging in the forest, then a piece of wood in the same condition, and finally signs on the ceiling and in the garden. In this guest-house there is also a baleful mouth, that of the maid, and a perfect mouth, that of the young woman of the house with whom Witold falls madly in love. Unfortunately, she has just married an architect of the most respectable sort. But is the young woman equally respectable? The third hanging, that of the cat, is Witold's doing. Why did he do it? And above all - will the fourth hanging be that of a human? Witold: I'm afraid of the dark. All the dark cavities. This toad is all about its slippery moisture. Fuchs: A crooked mouth and a dark cavity encroaked with the sparrow in a sphere of toady-sparrowy-Catherettery. Fuchs: A few more days with you and I'll win the Nobel Prize in thrillerettery. Polish director Andrzej Zulwaski challenges the notion of narrative cinema in his latest film 'Cosmos'. 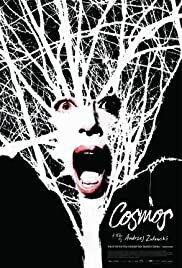 Fifteen years is quite a long time for an acclaimed director to have his film shown to audiences.However,it is worth the wait as Polish director Andrzej Zulawski has chosen an appropriate film to astonish both his admirers as well as critics.In 'Cosmos' the entire notion of narration is challenged.There is no straight plot and some of the lines uttered by actors might not make much sense to casual viewers. However,there is something gripping in the way actors have performed in a scenario where a lot of strange things are happening.Director Zulawski also pays his tribute to great writers and filmmakers in the form of their names mentioned in dialogs.Cosmos is not a run of the mill film with a clearly defined beginning,middle and an end.This is one reason why it is not everybody's film.Cosmos would appeal to those viewers who want to delve deeper into the idiosyncratic world of Mr.Andrzej Zulawski who is one of the most innovative filmmakers working in the field of cinema. 30 of 44 people found this review helpful. Was this review helpful to you?